The Alexandra Vancouver condos are an exciting new high-rise tower with iconic modern architecture that will forever change the downtown West End skyline. The landmark English Bay Alexandra condos in Vancouver will offer only 85 exquisite residences in this once-in-a-lifetime home buying opportunity and marks the first significant property development since the smaller mid-rise at O2 English Bay. The landmark Alexandra English Bay condo tower is designed by award winning Henriquez Partners and the developers is a joint collaboration between Concord Pacific and Millennium Development. The residential high-rise will be 21 stories tall, eclipsing most other buildings in the neighbourhood and each of the floors will have higher ceiling heights and luxurious finishes. 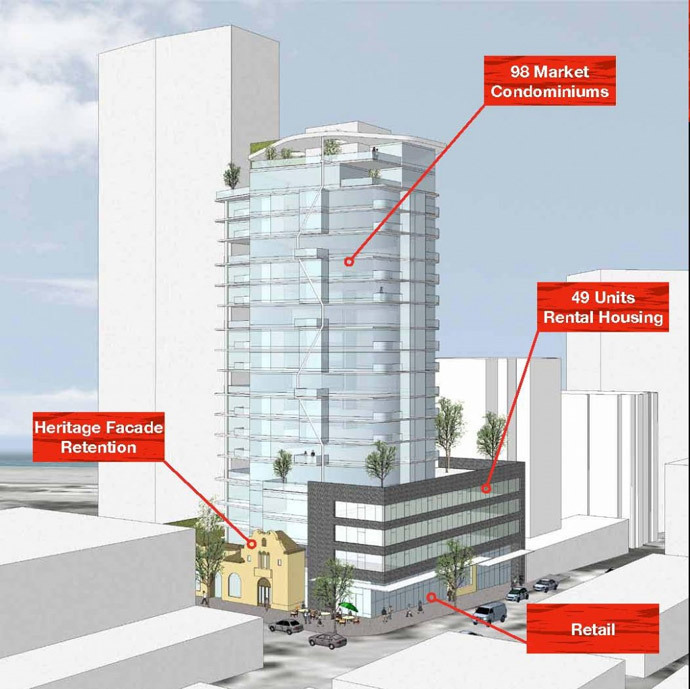 The location of The Alexandra Vancouver condo tower is at Davie Street and Bidwell Street in the original seaside neighbourhood, close to local services, amenities, coffee shops, restaurants, retail, entertainment, the seawall, Stanley Park and schools. The Alexandra English Bay condos in Vancouver real estate market will feature breathtaking views out to the ocean in addition to being one of only a few freehold West End Vancouver condos for sale. It also represents the only freehold English Bay Vancouver condominium development in the pre-construction and presale phase at this time. The combination of condo residences and sky terrace homes in addition to boutique penthouse suites makes The Alexandra condos a must–see for homebuyers seeking great West End downtown value coupled with superior features and finishes. The Alexandra English Bay condos is a once in a lifetime opportunity and VIP Previews are starting August with pre-sales starting Fall 2011. 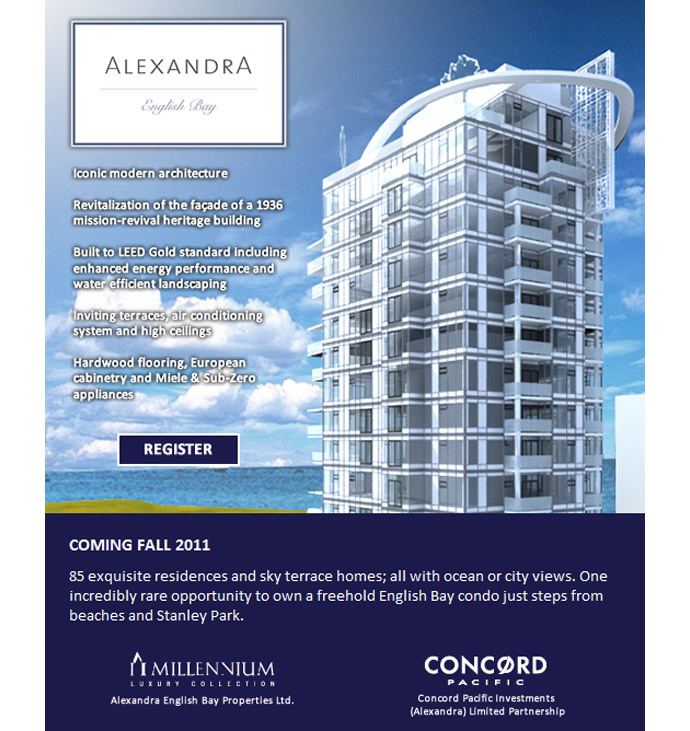 Visit www.alexandraliving.com for more details as they are released by Concord Pacific and Millennium Development. 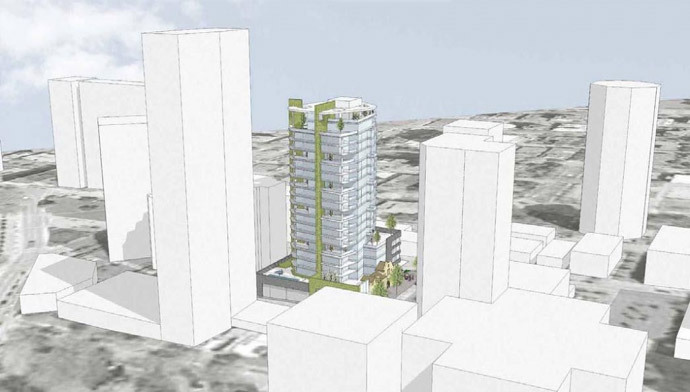 The project site is breaking ground and is located at 1215 Bidwell Street Vancouver. 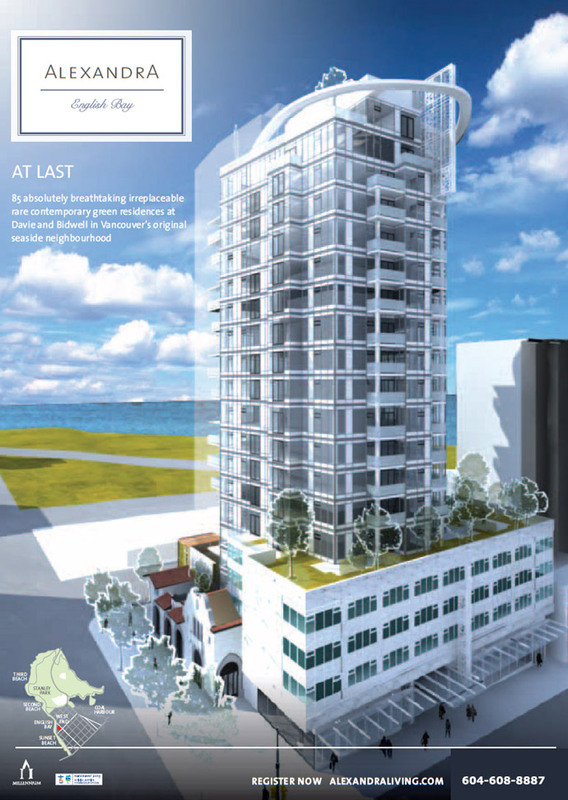 With the revitalization of the 1936 façade of the mission revival heritage building, the pre-construction Vancouver Alexandra condos in the English Bay real estate market marks the most unique architectural landmark this side of the downtown property market. Built to LEED Gold standards, the new Alexandra Condos in Vancouver real estate market will feature green building features including water efficient landscaping and enhanced energy and water conservation performance within each suite. The landmark architecture of The Alexandra English Bay condos will include expansive terraces and balconies with views out to the city skyline and to the beautiful waters. Some of the incredible features of the boutique Vancouver condos for sale at the English Bay Alexandra condo tower include air conditioning in every suite as well as high ceilings including 10 foot 6 inch over height ceilings for the penthouse units. Some of the other superior standard features of these downtown Vancouver English Bay condos for sale include premium hardwood floors, European style cabinets custom designed for your kitchen space, Miele and Sub-Zero appliances. The appliance set will include a four burner gas cooktop, integrated hood fan/oven, refrigerator, built in microwave, dishwasher and European cabinets. The Downtown Vancouver Alexandra penthouse condos will have 5 burner gas cooktops and integrated hood fan in addition to a wine cooler and larger appliances. Introducing luxury West End Vancouver condo living at Bidwell and Davie Street in the most sought after English Bay community. A spectacular and boutique downtown Vancouver real estate development designed by Henriquez Partners is launching right now at The Alexandra condos. Featuring a fine collection of only 85 absolutely breathtaking irreplaceable rare and contemporary green residences, The Alexandra Vancouver West End condo tower at Davie and Bidwell will become the most preferred prestigious downtown address in the city core. Perfect original seaside neighbourhood in the West End community is coming soon to the best location close to all community amenities, services, recreation, parks, green spaces, socializing areas, the seawall, water, English Bay, Sunset Beach, and of course Stanley Park! Brought to you by Millennium Development and Concord Pacific, the same developers that brought to the market the The Erickson, SMART Gastown, Uptown, the prestigious Olympic Village Millennium Water in Southeast False Creek in addition to the ultra luxurious Evelyn West Vancouver concrete residences and garden estates, The Alexandra condos in Vancouver will redefine West End condo living. Priority Registrations are now available by calling 604.899.7219 or you can also register your interest to get on the VIP List by visiting www.alexandraliving.com today! Located at Davie and Bidwell, The Alexandra will be coming in September 2011. 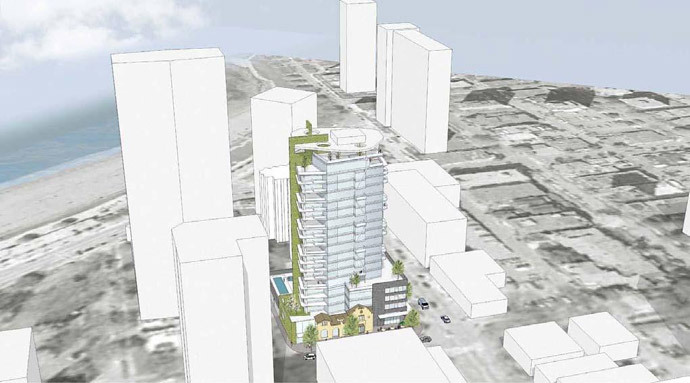 This seaside West End Vancouver condo development will present a rare opportunity for homebuyers to purchase a new downtown high-rise apartment in this 21 story LEED Gold tower that will present great water and bay views. In addition it is expected that the Alexandra English Bay condos will present a wide range of floor plans ranging from studio homes to 2697 square foot penthouses.